Free up essential cupboard storage space and protect glasses from high shelves and clumsy hands with built-in stemware storage. Hang glasses for a beautiful display and keep them in a place that is easy to reach with a specific stemware rack. Built-in storage for bottles helps keep them protected, frees up space in your cupboard or pantry and allows you to store the right bottle for any occasion. Enjoy the perfect drink at a special celebration or holiday meal with the use of your built-in wine bottle storage space. Great for a wine aficionado, this three-piece wall unit includes storage for 90 bottles. 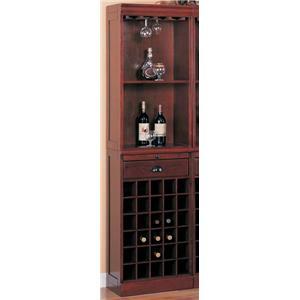 The warm Cherry finished wine cabinet offers additional storage with three drawers to keep clutter hidden, three pull out trays for extra work surface when you need it, six shelves to show off wine and other bar equipment, and stemware hanging racks along the top for your wine glass collection. With clean lines and classic molding, this traditional style bar wall unit will help you complete your sophisticated entertainment room. 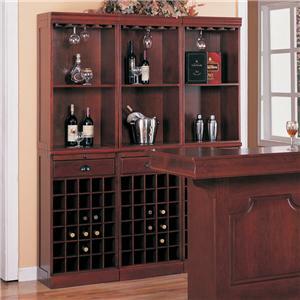 The Lambert Traditional 3-Piece Wine Wall Bar Unit by Coaster at Sadler's Home Furnishings in the Anchorage, Fairbanks, Sterling, Alaska area. Product availability may vary. Contact us for the most current availability on this product. 3080-1 Bar Unit 3 20" 13" 75.5"
Case Detail Classic panels, bracket feet. Description: Top Smooth tops with clean edge. 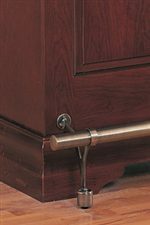 A traditional Cherry finish adds a refined and warm look to the Lambert bar set. The freestanding bar unit with a sink and storage is designed to help you create a home bar for gathering with friends and family, recreating the feeling of a cozy pub that you can call your own. Carved details, wood panels, and antique brass accents make this set stand out. The coordinating wine wall bar unit and coordinating swivel bar stool with leather upholstery completes the look of this home bar. The Lambert collection is a great option if you are looking for Traditional furniture in the Anchorage, Fairbanks, Sterling, Alaska area. 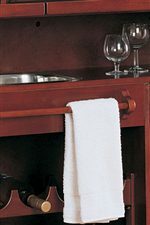 Browse other items in the Lambert collection from Sadler's Home Furnishings in the Anchorage, Fairbanks, Sterling, Alaska area.